Last week's lips were definitely inspired by fall. Cooler temps have rolled in to my neck of the woods, and I have been craving all of the fall colors. I did manage to sneak in some bright, bold colors, too - but I think you'll see a trend in what I wore last week. Monday: MAC Ruby Woo, a classic MAC color and one of my favorite blue-toned matte reds. This is a permanent color in the MAC range, and for those of you who pay attention to the various formulas, this is a retro matte finish. Tuesday: Maybelline Color Sensational lipstick in Mauve Me, a shimmering mauve that's not too shimmery. This color is still available for purchase at Ulta. Wednesday: Besame Cosmetics Exotic Pink, a creamy semi-matte flamingo pink. 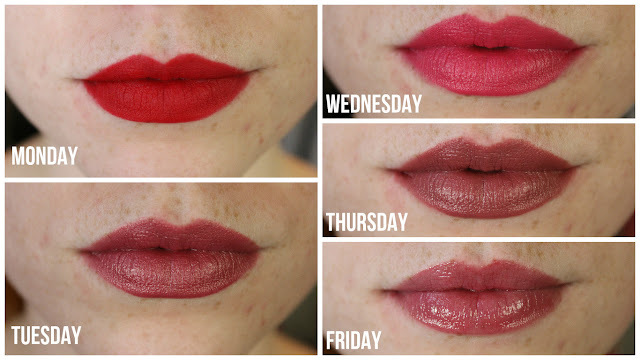 This lipstick is super pigmented and really comfortable to wear. Thursday: NYX B52, a mauvey brown cream lipstick. Pigmented, easy to wear, and not too heavy on the lips. Have you tried any of these colors? If you had to try just one I'd recommend the Besame Cosmetics lipsticks - they come in beautiful vintage packaging and the color payoff is exceptional. Let me know your favorite in the comments!